The Animated Woman: I draw YOU - Amiyrah Martin. I met Four Hats And Frugal vlogger/blogger in person at Aiming Low's Non-Con12. She smiles easily and is smart and funny and really good with the whole having-a-fabulous-time-while-not-spending-money-thing. But it was her Halloween costume that made me fall in love with Amiyrah Martin. Me: "Hey. What were those five golden rings for?" Amiyrah: "They were the rings of death, so mostly for dismemberment." Me: "Jeeeeezus woman. Lol. I pity your enemies." Amiyrah: "I have a lot of pent up anger and I project it all into my characters." Scary. But clever. Oh, so clever. I'm like...dude, how do I draw that? I need hats that rep. Being a frugalista with fashion sense, she wasted no time in giving me a list of her favorite four hats: "top hats, berets, baseball hats and those big floppy hats you wear to the beach". Her mom made her this cake. 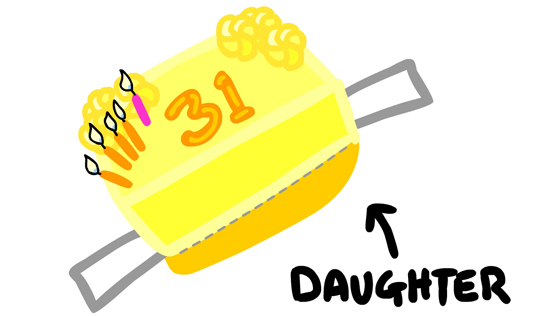 (I mean the actual cake; I drew the cartoon version). It makes for excellent headgear. You can totally cut these out and stick them on Amiyrah's head and they will fit. I am nice. What a great tribute to a great lady! This just rocketh harder than Rock City. This is the BEST THING EVER. OF ALL TIME. "Stealth twerker." This is one of your best yet, JC. I would have known this was Amiyrah (even without the bouncy booty).